It was a silent day today. Mostly. As silent as the desert can be. Maybe muted is a better word. You know how you get water in your ears when you are swimming? Kind of like that, but with sand, instead of water. We are closer to Baghdad. It’s the quiet before the storm. We walk in a straight line, in full battle rattle – that’s what we call combat load. If I ever return, I’ll bring you some of it. I think you would like the helmet. And the night vision goggles. We rarely talk when we walk in the desert. There is nothing insignificant enough to say. You may have started to notice, it’s the real thoughts, the real words that don’t come out. But we each know what the other is thinking. Marshall is thinking about Jasmine, hands-down, guaranteed. He gets this lost look, and trips every so often. If you ever get to the point where you are tripping over your own feet for some girl, I’m buying you a car. Or… since I will likely be a broke war vet, probably concert tickets. In the meantime, here are more of Aiden Hale’s Life Lessons to His Fictional Son. 5. Avoid getting sand anywhere near your balls. Yes, you can call them balls. In your case, they are still fuzz nuts but you will get there. 6. Men can reek. Shower every day, even if you don’t think you smell. 7. Sing in the shower. It doesn’t matter what. I prefer Led Zeppelin. You should start with Ray Charles, I’ve Got A Woman. It was my first shower song. 8. Take care of your mother. This is not a lesson, it’s an order. She likes books. Lots of books. On Sundays, pick up The Brothers Karamazov and start reading it to her, one page per week. It will bore you to death. Maybe we will finish it together. But one day you will know why you are doing it. I think we’ll realize his son is far from fictional. As is the contents of his letters. What does Marshal see when Aiden is thinking of his son? More Days, more Nights, more Snow, more Hale… Thank you, Ani. How this man can doubt his ability to love is beyond me. Writing to his would be son and his love for his would be wife shows his merit as a man. He’s such a good man. Ani, you’ve weaved together a story that has stayed with me long after I’ve read it. I don’t know what I would’ve done without Aiden’s story in the interim. This story will be on my list of favorite stories forever. Thank you for all the time you put into the world. 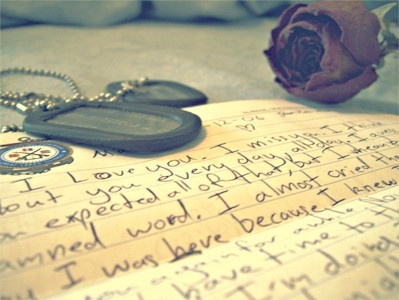 Something as small as a letter, pacts such an emotional punch.